All of these great trips weren’t possible if not for the invitation from Liliane Foundation Philippines. We had our first taste of the new system that they will be implementing for all of their partner-organizations. They had their opening salvo for the Visayas mediators and organizations that serve persons with disabilities. During the group discussions, most of the members label their clients as visually impaired, orthopedically impaired or ortho, autistic, mentally impaired and hearing impaired. Probably that is what they were brought up to tag the children they assist. When one of the participants from West Visayas requested me to assist their “Hearing Impaired” constituents for their IT training, I can’t help but feel surprised that they still call them as such. The same thing happened during the interview in one of the daytime TV programs here in Manila last Monday. * The first question asked by the host was, “How do we call you, deaf or hearing impaired?” Luckily, they invited prominent deaf people like Indie Film Actor Romalito Mallari and IT Expert Ervin Reyes. They both replied that they are more comfortable being called Deaf. Now, how do we really call them, Deaf or Hearing Impaired? I tried to google to get the answer. I got quite a few hits and video blogs like Jackseyes and DSQ89. Often they combine or interchange the two words. So I wasn’t able to get the right answer. Although each country has its own legislations and policies regarding persons with disabilities, we must consider getting the answer from an accepted international treaty, the United Nations Convention on the Rights of Persons With Disabilities (UN-CRPD). This law was ratified by the Philippines in 2008. Policies, future laws and bills that are filed must be anchored from the UN-CRPD which is fundamentally the rights based approached. If you scan UN-CRPD, it never mentioned the word “Hearing Impaired”. It used sensory impairments in Article 1. Sign language and interpreter words appeared in Article 2, Article 9, Article 21 which seek to promote it. Article 30 also included the respect of deaf culture. Deaf, deaf community and deaf/blind was mentioned in Article 24 thrice. Blogging and posting on Facebook wall are entirely different bananas. You need to spend a longer time composing a blog, while thinking a wall post will only consume around two minutes or so. Blogging entails a more detailed and insightful research on the topic. Since my blog is about deafness, deaf and their culture; I cannot deviate much from it. Inasmuch as I want to include issues from my other loves like web designing, Christian living and music, I am compelled not to post something about them simply because I will be “out of topic”. I already created four Fan Pages in Facebook. The first one was for our college for the deaf, the second one was for Liliane Foundation Philippines, while the third one was for the first Filipino Sign Language Font which can be downloaded and installed for FREE. The latest is for our Philippine Web Accessibility Group. Among the four pages, our college for the deaf topped with 855 likes with 319 active users. It is in this Page where I posted some very important announcements concerning the school. This is followed by Filipino Sign Language Font which has 606 likes and 92 active users. Incidentally, the FSL Font has already been downloaded more than 1500 times as of today, thanks to Facebook. Liliane Foundation Philippines has 54 likes with 30 monthly active users. Philippine Web Accessibility Group now has 50 likes with 48 active users. 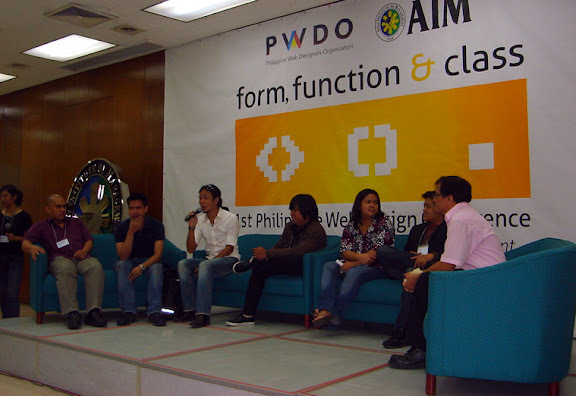 More than 400 attendees, way above the group’s goal, trooped to Asian Institute of Management (AIM) last July 10 to attend the very first Philippine Web Design Conference spearheaded by the newly formed Philippine Web Designers Organization (PWDO). Who would have thought that an event as big as this would succeed? Although it was already planned as early as September 2008, it wasn’t until early April when everything starts to roll (thanks to the completion of registration at the Securities and Exchange Commission in March 31.). There were so many kinks to iron out. As late as July 6, the group was still having a problem opening a bank account at BDO due to a mile long requirements which includes the securing of the General Information Sheet (GIS) from SEC. And to top it all, even if more than 300 registered online, only two persons actually paid in cash! Well, everything went great, way above our expectations! As part of the organizing team, I was aware about the group’s day-to-day developments. The bank account was successfully opened after I got the GIS from SEC. The Asian Institute of Management officials were very generous in giving the group a great venue, good food, free coffee and free wi-fi. The speakers were eloquent and knows their craft. The event started on time but ended quite late due to the Q and A part. What I am really proud of is the successful holding of the “Disabled Friendly Website Awards” courtesy of the Philippine Web Accessibility Group and the National Council on Disability Affairs. 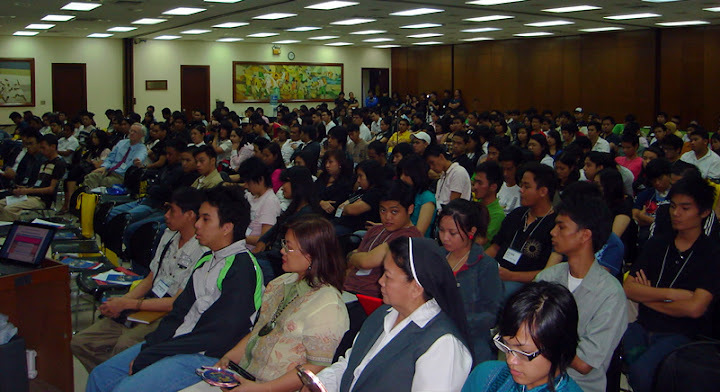 Previous awarding rites were led by the government as part of their program of events. This time, I’m proud to say that it was done in a non-government affair and in front of “real” web designers, not just some government employees who attend government sponsored seminar-workshops with the sole purpose of escaping from work and getting the comforts of free hotels and travel. They all received a plaque of appreciation courtesy of the NCDA. Awardees (from left): Regnard Raquedan, Eloisa San Mateo, Sis. Agnetia Naval, Anna Monica Esguerra, Jojo Esposa and NCDA Director Geraldine Ruiz. Regnard, PWDO’s President, on his interview by the Philippine Daily Inquirer said the group envisions third party certification for Web design in the Philippines. They also look to help train designers in developing their skills further and also to establish ethical and best practice guidelines.